“If I flipped a franc, it would land on something worth swallowing,” David Downie writes of his arrival in Paris in 1976. He remembers, as I do, gazing into the yawning seven-story hole where Les Halles had provided food and drink to all Paris until its relocation to suburban Rungis several years before, and he laments much more strongly than I do the second replacement for the historic Baltard canopies, the massive skate wing that covers the new and very chic shopping center. Les Halles has come a long way, from Zola’s Belly of Paris to yet another pricey and upmarket shopping center. Downie’s newest book is the third in his recent series of memoirs/explorations of Paris. Beginning with Paris, Paris: Journey into the City of Light (2011) and continuing with A Passion for Paris: Romanticism and Romance in the City of Light (2016), the series explores his fascination with his home city. I still think Paris, Paris is the best guidebook I’ve read, and it’s not really a guidebook but a slow, guided introduction to fascinating aspects of the city. A two dozen peeks through a two dozen keyholes, which together add up to a rounded view. The list of Downie’s books is long. There are more than a dozen on it. I haven’t read all of them but I’ve read and enjoyed a good sample, and many of them have food at their center. Or wine. Or food and wine. 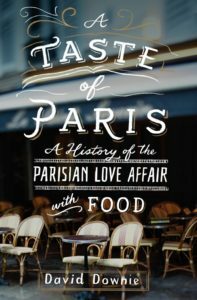 Unless you are a serious student of French culinary history — enrolled at one of the big cooking academies, for example — I suggest you approach A Taste of Paris the way you’d approach a historical novel. It is nicely written, in Downie’s own idiosyncratic style, and full of facts and sidelights about the historical personalities, including the three King Louis <sup>(see links below)</sup> whose reigns led up to the Revolution. It’s entertaining. As you get into it you’ll appreciate more the sheer depth of Downie’s knowledge about Paris, France, food, and any combination of the three. I still remember reading his Food Wine Burgundy and thinking it contained more information per square inch than anything I’d read. A Taste of Paris comes close. Readers of this blog know that Paris is my favorite city, and that I spend a lot of time there researching and writing my novels. One of Downie’s sidelines is as a tour guide, and a few years ago my sister, visiting with friends from Texas, asked him to guide her group, and invited me to tag along. It was an impressive experience. Downie’s knowledge of the city’s history is precise and seems bottomless. The part of A Taste of Paris I enjoyed most was Downie’s discussion of more recent years, such as the story of Les Halles. I remember with pleasure the midnight dinner of pigeon Jan and I shared with the financial editor of the International Herald Tribune and his wife in the early seventies, when we were freelancing in Frankfurt and writing business and financial stories in the German-speaking countries. Les Halles as Zola described it almost exactly a hundred years before, down to the rich onion soup that made up an obligatory part of every meal. I’ve enjoyed meals at restaurants he mentions, many of them, and bought a peppermill at E. Dehillerin, which he calls “the most famous and labyrinthine of several kitchen supply emporiums” in the area. It’s like your grandfather’s hardware store. And I’ve also visited and recommend the famous sculpture by Raymond Mason, in a side chapel of the imposing Saint-Eustache church which looks over Les Halls. In modern style, it depicts vendors when they left Les Halles for the last time in 1969. It’s colorful and atmospheric. St. Martin’s Press, published Sept. 26. When there’s more than one King Louis, what is the plural? Here’s one good exploration. Your mileage may vary.